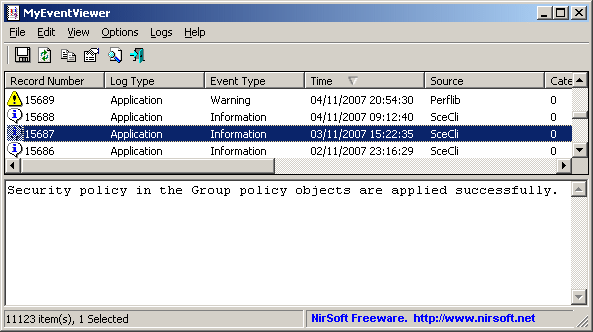 MyEventViewer is intended as an improved alternative to the standard Windows event viewer. The program allows the viewing of multiple event logs combined into one list, as well as the event description and data in the main window. The program lets you easily select multiple event items and then save them to HTML/Text/XML file, or copy them to the clipboard (Ctrl+C) and paste them into Excel. Vista+ users are encouraged to use the updated FullEventLogView utility. How to extract: Download the ZIP package and extract to a folder of your choice. Launch MyEventViewer.exe. I forgot to mention that heuristic detection only indicates that something MIGHT be amiss, not that there IS something wrong.